Acne vulgaris, the most common form of acne, is a skin disease characterized by the blockage of the pilosebaceous unit (sebaceous gland + follicle), that causes the formation of pimples among other types of skin lesions. It is commonly referred to as a blocked pore because the opening of the pilosebaceous unit is occluded by a plug of dead skin cells, oil (sebum) and compounded by inflammation. There are actually several types of skin lesions involved in acne from the comedones (‘whiteheads’ and ‘blackheads’) to a papule (solid pimple), pustule (pus filled cysts), plaque (large flat-topped lesions) and even an abscess (boil) in severe cases. The condition typically starts in the early teen years and peaks around the late teens to resolve by early adulthood. It can sometimes not occur in the teen years, or on the other hand persists all the way to the 30s, particularly in females. Acne appears to be a combination of several factors – hormones, excessive sebum, and bacteria – which contribute to plugging the pores of the follicles and thereby preventing the passage of sebum. First, an increase in the androgen (male hormone) levels causes the epidermis to rapidly grow without shedding fast enough (hyperkeratosis). The excess dead skin cells may cause a follicular plug which may trap sebum. In addition, the androgens and the progestogens (one group of the female hormones) to a lesser extent causes increased sebum production as discussed below. Sebum is the oily substance secreted by the sebaceous glands and empties into the pilosebaceous ducts. It is necessary to moisturize the hair and skin to some extent. An overproduction causes the skin to become oily (seborrhea). It further contributes to the follicular plug by causing dust from the environment to adhere to it. Propionibacterium acnes is a type of bacteria that causes inflammation of the plugged pilosebaceous unit by secreting chemical mediators that promote inflammation. Medication like corticosteroids, lithium and some antiepileptics. Cosmetics, particularly covering makeup like foundation, concealer and powder. Hair care products, including hair oils and pomades. Hormonal disorders or altered hormonal states like polycystic ovarian syndrome (PCOS) or pregnancy. Acne vulgaris involves a number of different lesions. The formation of a plug and blockage of a pore may initially present with a whitehead (closed comedone ~ completely blocked) or blackhead (open comedone ~ partially blocked). These plugs (keratin + sebum + sometimes dust) are lodged deeper in the duct in a whitehead or more superficially in a blackhead. A combination of oxidation and bacterial breakdown products causes the black color seen in blackheads. There is no inflammation of the skin at this point. As the plug blocks the pore to a degree where sebum is trapped within the follicle and the attached sebaceous gland produces excessive quantities of sebum (oil), the area may become inflamed. Pimples (papules) are small solid lesions that form at this point. 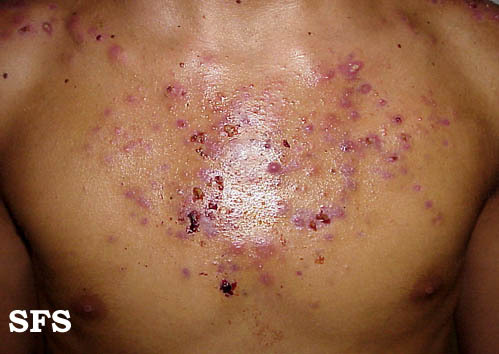 Deeper solid lesions are known as nodules. Severe inflammation often associated with bacteria causes the formation of superficial pustules or deeper cysts which are filled with pus. Although not common, an abscess (boil) may form in severe cases when a large quantities of pus in the deeper layers of the skin gets walled off from surrounding healthy tissue. Acne tends to occur in the areas with more sebaceous glands – face, back and chest. This extends to the shoulders and can occur as low down as the buttocks. In the non-inflammatory state, the excess of dead skin cells and sebum form a plug known as an open comedone (blackhead) or closed comedone (whitehead). With inflammation, this progresses to pimples, cysts or nodules. Abscesses are seen in more severe cases. The degree of scarring in acne varies and is dependent on factors such as trauma to the area. Acne conglobata or conglobate acne typically presents with extensive pimples and pustules, nodules and even abscess formation. There may be sinus tracks often associated with keloid scarring. It usually results from pimples and pustules that do not heal and the occurrence of further complications associated with prolonged and severe inflammation and infection. 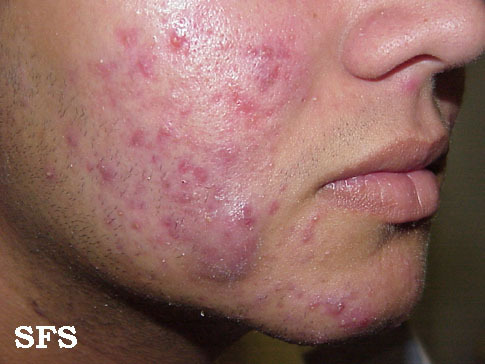 Acne fulminans is seen with severe inflammation that is often of sudden onset. Other non-dermatological features include fever, joint pains and systemic indications of inflammation evident in a raised ESR (erythrocyte sedimentation rate). It may follow through from acne conglobata especially if treatment is unsuccessful. Cystic acne is not very common and is characterized by widespread cysts (deeper lying pus filled lesions) and/or nodules (deep solid mass). It is also known as nodulocystic acne. Depending on the severity, it may cause the formation of sinus tracks and sunken areas commonly referred to as pits. Acne excoriée is acne complicated by picking, squeezing and scratching of pimples. The trauma to the area causes the inflammation to persist for longer periods of time or exacerbate and leads to scarring. It is more frequently seen on the face as the psychosocial impact of facial acne compels the person to attempt to remove it manually. Acne excoriée is also more common among teenage girls. Severe acne usually cannot be treated without medication. However, good skin care may assist with preventing a recurrence and help to reduce further inflammation. Topical treatments may include medicated creams, ointments or gels. Face washes, soaps and spot creams and even facial wipes may all help to some degree. These may be available as over-the-counter (OTC) products usually containing one or more of these ingredients – benzoyl peroxide, salicylic acid, resorcinol or lactic acid. Prescription topical treatments should only be used when a doctor prescribes it for the patient who is undergoing treatment – these products should not be shared. Good skin care does not only involve using specialized skin care products. Frequent washing of your hands and face can help minimize infection and clear the skin surface of excess sebum (oil) that may cause dust to adhere to it. A person should learn restraint and not pinch or pick pimples. Squeezing pustules and cysts and draining out the pus is never advisable and can often exacerbate the condition. Patients should also avoid using makeup in an attempt to cover up the skin lesions and scars, especially concealer, powder and foundation, as this often aggravates the condition. In addition to the medication used in mild to moderate acne – antibiotics and oral-contraceptives in females – severe acne may require the use of the drug, isotretinoin. Anti-inflammatory drugs and even corticosteroids may be used initially to reduce severe inflammation but it must be noted that corticosteroids can aggravate acne and cause pustules (pus-filled pimples) if continued long term. Isotretinoin has been the focus of much controversy due to the severe side effects associated with the drug. It should only be prescribed by a dermatologist after all other therapeutic measures have failed and only for the severe types of acne mentioned above. Close monitoring is essential and should be avoided by those with mental health problems like depression.